Being at one of the early release sites, it’s now been over a year since I moved to the NBN. In truth, I did have to keep my copper connection active in order to keep my POTS phone number, but that’s another story. As of this month NBN Co started dropping letters on everyone indicating the 18 month window of dual copper-fibre service in the area had come to a natural end. From March copper phone and internet services will cease and we’ll all be on fibre. I hope there isn’t too much disruption among those homes and businesses that could get the NBN but haven’t moved yet. Get your mobile handsets ready! Interestingly, there was an article this week about the prospect of supporting two types of fixed-line access methods like copper and HFC/Cable or FTTP. That might have made sense 20 years ago when the first cable networks were rolled out in this country, but nowadays fibre does voice and data very well and we have more expansive and faster mobile networks. I’m all for a multi-technology mix – where it makes sense! In an expansive suburban area like mine, where it’s not uncommon for premises to be several hundred metres from a node, let alone an exchange, fibre is the best option and the natural successor to copper. If you can push 100Mbps down existing copper lines in an high-density apartment building using FTTN then sure, go ahead and do it and save yourself the cost of retrofitting fibre. But there is not much point in “investing” in FTTN technology in suburban areas using the old copper network only for people any distance from the node to end up with DSL speeds. We’ll just have to see where the MTM approach ends up. One of the things I’m happy to report is my home phone number was easily ported from the copper to the fibre connection by my ISP. I’m using the UNI-V port on the NBN router, not a VoIP service and the call quality is just as good, if not better, than what the copper network delivered. 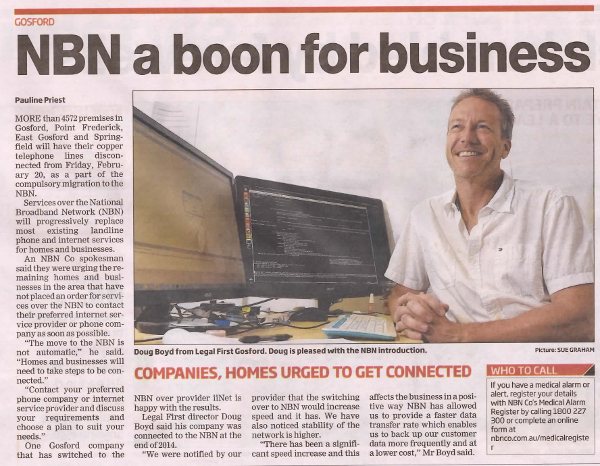 NBN Co has received some favourable press from our local newspaper, the Central Coast Express Advocate. A local law firm has moved off copper completely and is enjoying the benefits of the NBN. The photo in the article also shows the business is using Ubuntu Linux on at least one desktop – go Ubuntu! NBN Co is not going back to any original plan, but they will look for alternative technologies to determine the best solution for each given neighbourhood. Building FTTP in some places would put pressure on the project’s costs. Everything should be sensible for everyone since it is funded by taxpayers’ money.